Can you imagine using one of these? Pretty cool that the husband is kicked back and relaxed with pipe in right hand and possibly an old fashioned in his left. Back in October 1957, they demonstrated the “Power Mower of the Future” – the future of lawn mowing equipment with a beautiful bubbled model that sported its own air conditioning. 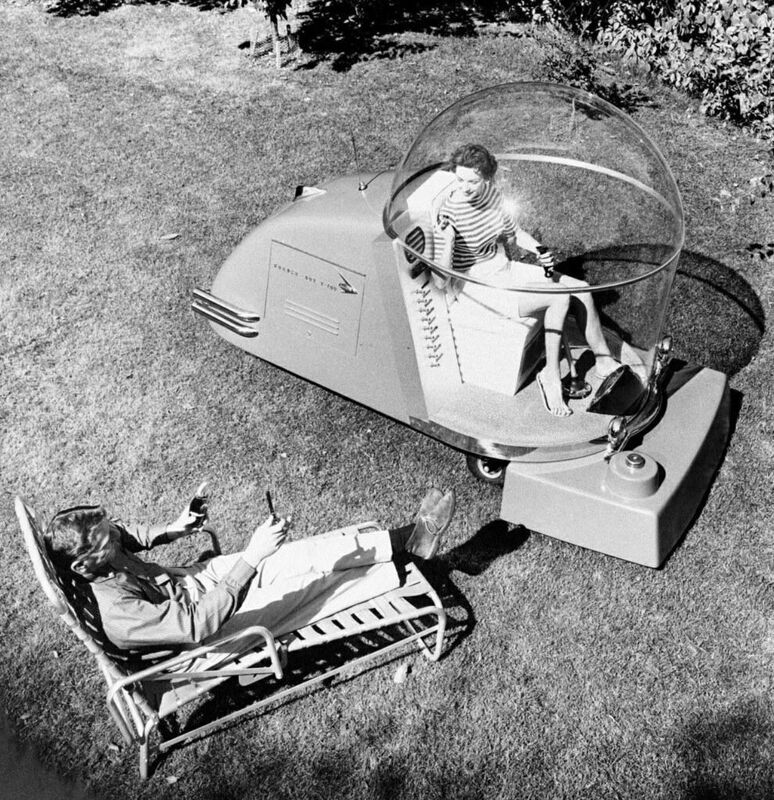 The lawnmower has a five foot diameter plastic sphere in which the rider sits on an air foam cushioned seat. It has its own electric generating system for operating running lights, a radio telephone, air conditioning and even a cooling system to provide a chilled drink on a hot day. It can be used for many purposes. It can mow the lawn, weed it, feed it, seed it, spray for insects, plow snow and haul equipment. It can even be used as a golf cart. Just think – with the complete enclosure there would be no stray balls to worry about, and why don’t we have this today?